The Hardest Game. For Adults. I have come to realize that, for adults, Minecraft is among the most difficult of all video games. 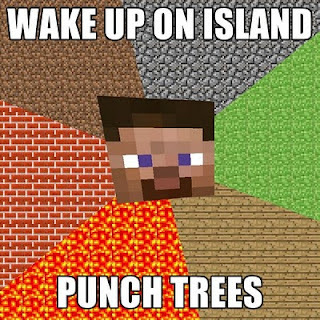 Minecraft is amazing for kids. All of the children in our social circle have been completely absorbed into the Minecraft collective. They make huge towns. They discuss the relative merits of the Adventure Update. They install mods. They set up LANs and explore each others' worlds. Whatever its merits as an educational game, it's certainly made our kids learn what an IP address is. When we took our nine-year old daughter to PAX, she insisted on waiting in line to have her picture taken with Notch, Minecraft's creator. I spoke with him and mentioned that I run Spiderweb Software. He said that he'd played Avernum. This one fact did more to elevate me in her view than any single event since her creation. The kids are mad about the game, making spiraling towers, roller-coasters, water slides, and mad dreamscapes. But what about the adults? Many of the guardians of these children tried Minecraft themselves. Few of them played more than an hour or two. Now note, these are nerd grown-ups, gamers, people who actually finish games. Grown-ups rarely have time to play games. These are people who make time. But I played for more than any of them, logging a mere ten hours. "I didn't know what to do." "I didn't see the point of it." "I didn't have a purpose." And then they looked at me as if all this made perfect, self-evident sense. And the thing is, it did. I always nodded with genuine sympathy. And then I realized how depressing that is. Suppose you asked an adult, "What do you think of Legos?" and got the response, "I don't like them. I just look at them, and don't know what to do. What is the purpose? What is their point?" What would you think of this response? Would you find that person to be Awesome? And not, maybe, I don't know, just a wee bit depressing? Tell me, what do you think of paper? "It's blank. That stresses me out." What about clay? "I don't know what to make, so it's pointless." Look. You can make things with this. "But creativity makes me tired." I'm not pretending I'm not the same way. I don't think I'm any better than my peers. I'm just the same. I had a blast playing Minecraft! I built a little house, so that I could be safe from monsters. I made a mine. And then you know what I created? I built a two story house for a family of four. Bedroom for the parents. Bedroom for two children. Kitchen. Workshop. Field of crops so we could eat. A big wall to keep us safe. I even baby-safed the damn thing, to keep my non-existant Minecraft four-year old from falling down the stairs and into a lava pool. And then I was done. I recreated the world I see around me every day, to the maximum fidelity cube-world would allow. And then I stopped playing. Success. Isn't that extra-depressing? Even in my fantasy world, I had to have a mortgage. 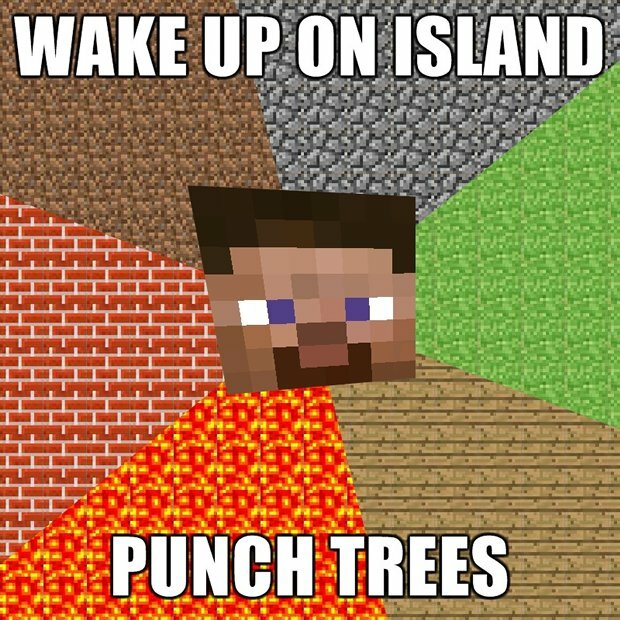 Why Minecraft Is the Hardest Of Games. For Adults. I have not made any big, unique discovery here. It's been common knowledge for a long time that a kid can have just as much fun with a toy as with the box it came in. We take this loss of creativity as we age for granted. It's only when it happens with a video game, the sort of thing adults can play, with weapons and monsters and gold, that it comes into much sharper relief. Of course adults don't color with crayons. That activity is in a box in our brains labeled "Kid Stuff," and we can ignore it safely. But Minecraft is new, so we have to evaluate it with fresh eyes. To play Minecraft (before the release of promised updates with boss fight and goals and other dreadful things), you have to play. Not in the linear way, walking down a hall and shoot guys in the face on the one course the designer created for you. To play Minecraft, you have to Play. Playground-style, without fear or hesitation or second-guessing. You have to, without self-consciousness, be creative. My old, withered, linear, fight-or-flight, calculate-reward-for-effort brains just can't do that anymore, not without great strain. To play Minecraft for more than a few minutes, you have to act like a kid again, in the good way. And that is HARD. I don't know if I can do it. One of these days, some rare, free afternoon, I really need to sit down for an hour, just an hour, and try.